The University of Pennsylvania’s Field Center for Children’s Policy, Practice & Research celebrated its fifth anniversary with a reception last week at the Please Touch Museum. Speakers included Penn President Amy Gutmann, the Montgomery County District Attorney, Risa Vetri Ferman, and Administrative Judge Kevin Dougherty from Philadelphia Family Court. 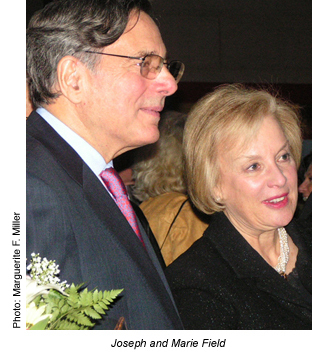 The Field Center’s fifth anniversary reception honored Joseph and Marie Field, the Center’s founding benefactors. • Bringing together technology experts, child-welfare leaders, business entrepreneurs and government officials to develop a national model of portable information technology to provide child-welfare workers with real-time information at their fingertips. • Helping to establish a child advocacy center in Montgomery County, PA, so that victims of sexual abuse do not have to undergo multiple traumatic interviews with different people. • Creating the “One Child, Many Hands: A Multidisciplinary Conference on Child Welfare,” the nation’s leading multidisciplinary conference on child welfare. • Cultivating the next generation of leaders by training and mentoring medical, social work, law and public-health graduate students and fellows. • Establishing a new county-wide medical clinic for victims of sexual and physical abuse. The Field Center for Children’s Policy, Practice & Research is an interdisciplinary collaboration of the University of Pennsylvania’s schools of Social Policy & Practice, Law and Medicine and the Children’s Hospital of Philadelphia. It’s the only center of its kind in the nation. Guided by the country’s leading experts, the Field Center imparts critical change in the child welfare system to improve the lives of victims of child abuse and neglect.